Get soaked! 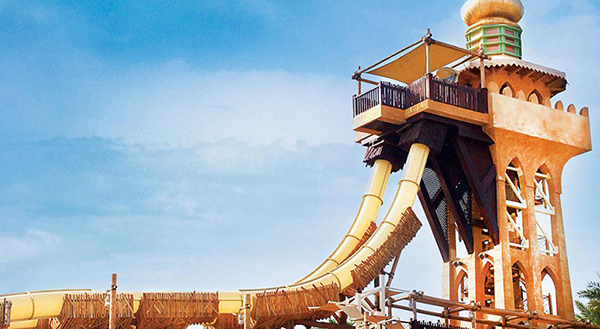 For those who can’t get enough of water-action, Wild Wadi - the wildest waterpark ever is just the place for you. It is 12 acres of pure fun with 30 adrenalin-pumping rides and attractions that leave you gasping for more. Situated between Burj Al Arab and Jumeirah Beach Hotel in Dubai, it's just a 20-minute drive from the city centre. Get there and go wild! Thursday evenings is Ladies' Night; admission is only available to women and girls as well as boys under the age of 8. Valid ID may be required as proof of age for boys. Select an adult ticket if you are 3 feet 5 inches (106 cm) or taller, otherwise select a child ticket. Some of the rides in Wild Wadi have a height requirement of minimum 1.1 metres - therefore please note that guests below 1.1 metres won't be able to play on all the rides in the waterpark. If the guest is measured at the entrance and found to be above 1.1 metres, the guest will be asked to pay the difference for full General Admission. Wild Wadi rates and opening hours are subject to change without prior notice.